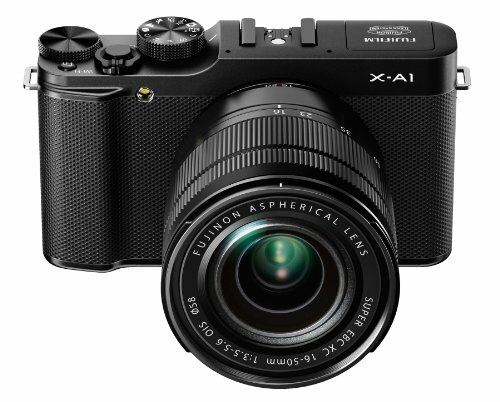 You don't need to spend a great deal to bag a decent camera these days, as Fujifilm proves with the X-A1 - the interchangeable lens camera that sits at the introductory end of its compact system camera lens line-up. Entry-level it may be, but it shares not only a lens system, but also a sensor size and resolution with its higher-priced siblings. A certain bargain then? We've been using the Fujifilm X-A1 to see if it all stacks up to perfection. The X-A1's body is clad in an unconvincing faux leather and although in many ways it bears a striking similarity to the Samsung NX300, it feels like a cut-price edition because of this. Both models come with foldout screens, but on the Samsung it's touch sensitive, but not so on the Fujifilm. Each also has an APS-C size sensor, but while the Samsung chip sports 20.3 megapixels, the Fujifilm has 16 megapixels. There's often much to be said for limiting the number of pixels on a sensor as it gives each one "room to breathe" and often this results in cleaner images. However, while we don't have an NX300 to hand and so can't test the two models side-by-side, we thought that Samsung's camera produced consistently high quality results throughout, making those extra four megapixels a tempting proposition. But it's what Fujifilm has - or more hasn't - done with this particular sensor that's of interest. While the likes of the X-M1, X-E1 and X-Pro1 each come with a Fujifilm-specific sensor array and no low-pass filter for extra-sharp shots, the X-A1 heads down the parth of the more traditional sensor with Bayer array. That might be more geek-out information than you need to know, but it's the reason the model comes in at the affordable level it does. As ever the X-A1 is still compatible with Fujifilm's X-mount lenses, so it shares a common heritage with the venerable X-Pro1. Some of the top-spec lenses are very impressive indeed. There is plenty to like about the X-A1. It's light, the articulated screen lets you take more creative shots from unusual angles and the menus are the standard - and excellent - Fujifilm fare. There's an integrated flash beside the hotshoe, while the mode selector mounted on the top plate gives you access not only to the usual manual shooting modes, it also includes portrait, landscape and sports modes, and various filters and effects besides. Manual mode is very easy to get to grips with courtesy of a dual wheel set-up - one on the top plate and one at the rear - handling shutter speed and aperture respectively. In aperture priority or shutter priority modes the parameters are dialed in using only the rear wheel, with the top plate equivalent handling exposure compensation, stretching two stops in either direction in 1/3EV steps. There are plenty of options for tweaking the settings to suit your own way of working. You can reverse the direction of the manual focus ring, for example, and there's a handy function button on the top plate that you can assign to your most commonly used setting such as ISO, image quality or self-timer. We tested the X-A1 with a 16-50mm kit lens, which is a 24-76 mm equivalent in old money terms. Or think about it as a lens with just over 3x zoom. Maximum aperture at wide-angle is f/3.5, and at full telephoto it stands at f/5.6. Either of these is sufficient for a shallow depth of field with an attractive blurring to any parts that fall outside of the focal plane. This lens is one of Fujifilm's new XC series lenses with reduced weight and high-speed autofocusing. It's also a more budget offering, as fits with the X-A1's ethos. In normal use, minimum focusing distance is 60cm, which is fine, but keeping you 30cm away from your subject in wide-angle macro mode is less enthralling. It's one of 12 lenses now available in the range, which between them cover all the required bases - from an ultrawide 10mm to a maximum zoom of 230mm, depending on your choice of glass. There's also an adapter for M-mount lenses. Fujifilm's slowly generating the arsenal of lenses it needs to attract a wide audience. It's good beginners lens, too, and lived up to Fujifilm's promise of being consistently fast to find focus, even when we tasked it with tricky subjects like marsh grass being thrown about in a stiff breeze. Images were sharp at the centre of the frame, and although there was some inevitable fall-off towards the edges and corners it wasn't so pronounced as to be obvious - you had to go looking for it. It's easy to isolate whichever subject you want using the autofocus options. Pressing the rear-mounted AF control pulls up a grid of 49 spots on the X-A1's screen, to each of which you can assign the focal point, while the rear-mounted or top-plate wheel can be used to change the size of the sampled area. Of the shots we gathered when shooting with the X-A1 we found the colours were accurate throughout our tests, even when shooting outside in the dying light, although some grain did start to become more obvious at reasonably low ISO sensitivities. It's not particularly disruptive grain, however, but a presence nonetheless. Indeed, grain was noticeable at just ISO 800, a setting self-selected by the X-A1 even though we were shooting a brightly-lit subject. When not zoomed to 100 per cent scale fidelity was good, with even fine detail like cat fur accurately reproduced. When it came to dark subjects against an overcast sky - a tricky challenge - the camera metered very well, maintaining accurate variation across the cloudscape even when the darker subject was used as the metering point. Tweaking the levels in post-production to dampen the highlights and lift the shadows revealed that the amount of detail captured by the X-A1 was far higher than it first appeared, so there's plenty of opportunity for getting more creative with your shots when you get back to base. So the change to the standard Bayer array sensor hasn't had a wildly negative impact to the X-A1, it's results are decent even if there is a touch of grain at some of the lower mid-level ISO settings. On the moving-image front there's also 1080p movie capture. There's no separate movie mode, though, which is a good thing in our book since it means you can start shooting video from any regular stills setting by accident. Footage is captured at 30 frames per second at either 1920 x 1080 or 1280 x 720. We picked the former for our tests, with continuous auto focus in operation rather than the centre or manual focus alternatives - but all are available. The results were good but not perfect, with some blurring on pans while the lens decided to refocus. There's no powered zoom from this particular lens, of course, so you'll have to handle that by hand which can add to the joltyness. But the cuff surrounding the barrel is smooth and quiet, so the motion is barely audible on the soundtrack. Wind noise, however, is evident, and there's no option to filter this out on the movie menus. The Fujifilm X-A1 puts in a very good performance, and although we felt it was missing a few niceties when stood beside its closest competitors, we found them easy to overlook on account of the affordable price. That's the key thing about the X-A1: at £499 all in - including the 16-50mm f/3.5-5.6 lens - the camera is a bit of a bargain. Great to use - and there's built-in Wi-Fi for saving images straight to your PC, managing them via an Android or iOS app - it's also the camera that represents Fuji's expanding platform. But it is more basic than the original models in the range that pushed "pro" aspirations. Then there's the competition. With the likes of the Samsung NX300 falling in price, and other models such as the Panasonic GX7 and Olympus E-PL5 offering super-fast autofocus that's more A-list than Fuji's offering, there're some serious alternatives out there. So serious they chink the X-A1's armour. Or, we mean, faux leather.